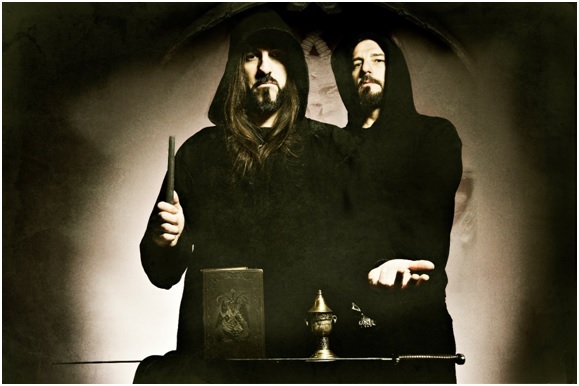 I once broke a tooth at a Rotting Christ show and when I was asked to have a chat with Sakis, I thought hell yeah, because I need to send him the dentist’s bill. Luckily he has a great sense of humor. We chatted about daily rituals, philosophy, and good first impressions. Regardless of your taste in music or personal preferences we all agree that these guys managed to stay humble and true to their values. I picked Sakis’ brain to find out how he does it. I greeted him politely once again after we already had a mini chat off the record as he called me an hour ahead of our scheduled date. It’s an honor he said, humble as always. Welcome to our dark kingdom, behind the sun. We are both Greeks so we did the interview in Greek, which was new to me and made me kind of nervous. Sakis was really friendly though and made things easier. I thought I should start with a meaningful question and save the jokes for later on. We share the same mindset, Sakis and I. And we have the same tattoo as well based on that mindset, however, mine has nothing to do with the band or the album, it’s just the way I aspire to live my life. Sakis, what’s the most important thing you had to sacrifice for your “Non Serviam” mindset? My personal life, which sadly cannot be peaceful. I am someone who had to travel for 30 years, a troubled mind, someone who doesn’t get to spend a lot of time with his kids. All these lead to a turbulent life. It has nothing to do with the quality of relationships though. The worst part is that you don’t get to see your kids as much as you want. That can really get to you. On the other hand, you hope that your kids will be proud to have a father who loves them, a father who creates something. You have to weigh everything, so I chose to go on, despite the hardships. To have a purpose. 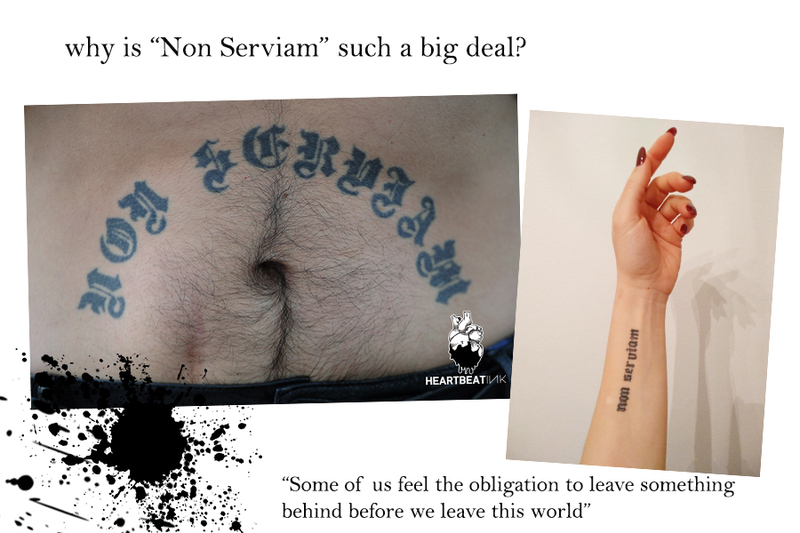 Some of us feel the obligation to leave something behind before we leave this world, so “Non Serviam” is a big deal to me, as well as “Κατά τον δαίμονα εαυτού” [meaning: to be true to your own spirit]. That gives me the strength to keep going until now. That was the perfect timing for me to ask my next question. My true Rotting Christ fans will be familiar with the quote, I thought to myself. We live. Some like to live in the moment, others are idealists, there are so many sides of life and that’s the interesting part. Because we all play a role here, we don’t know what’s right or wrong. But to me at least, the right thing to do is to have a vision, which may sound a bit “romantic” to some, or a waste of time. But you know, we all have to find a fairy tale, a dream. Otherwise, there’s nothing interesting about life. 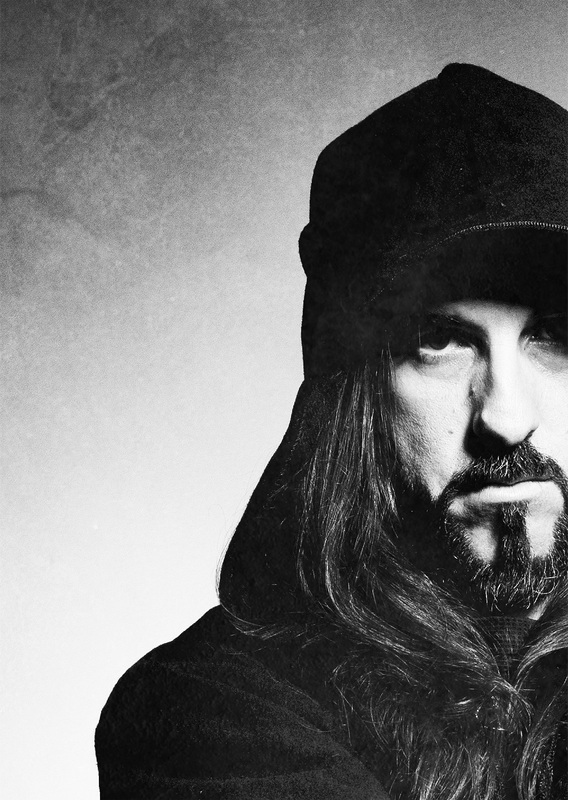 Sakis, there are a lot of bands out there, with provocative names and controversial lyrics or artwork straight out from hell. (He laughed). 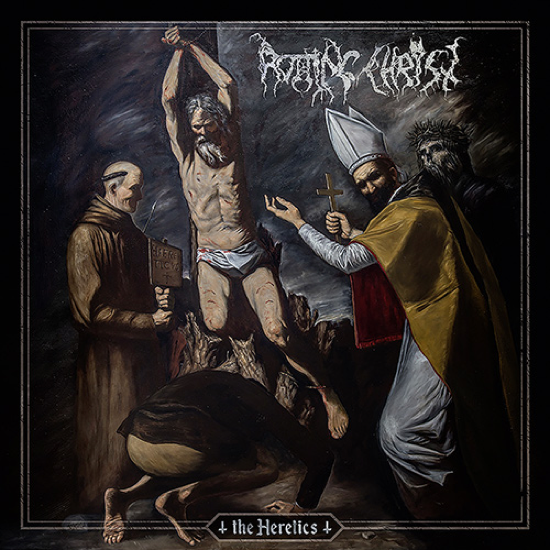 Why is it that Rotting Christ always seems to get in trouble? Because we are very active. We perform everywhere. It would be super safe to stay home but we don’t. But, hey it’s not such a big deal. That’s a tiny portion of what we live. It’s not such a big problem. The sad part though is that things keep getting worse. And it’s a really bad omen, worldwide. Financial recess mainly. When there’s financial well-being, everyone seems to be open minded. But when the struggles kick in, our fears come out, which leads to extremities. And extremities are the foreshadowing of all things evil. I hope I’m wrong but if you look back at history, this is what happens. I read a lot of history. I’m not trying to sound wise or anything, by saying that, I just read a lot about history. Let’s lighten things up, I said, and I told him the story of the broken tooth at their show. 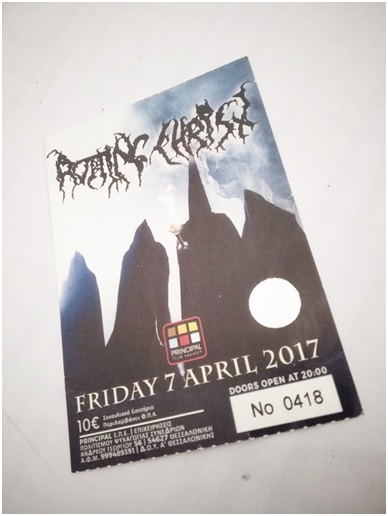 I realized that I had a broken tooth the next morning because when you are at a Rotting Christ show the energy and the adrenaline is so high that you feel nothing but the music. Oh no!! He said. I’m so sorry! Ouch! I reassured him that it was all worth it and that it’s one of my best battle scars. It’s like a medal he exclaimed! A metal medal, I said. See, we are on the same page. Metal geeks, laughing at metal puns. Everyone else gave me weird looks when I explained my mosh-pit battle-scars theory, but Sakis gets it. 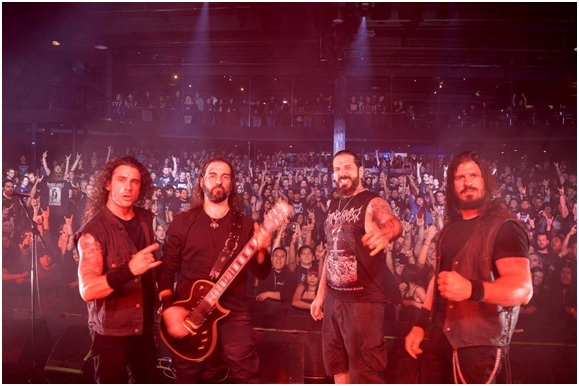 But I didn’t share the story just to show off my battle scars (ok, maybe 60% to show off my battle scars) I wanted to know when was the last time that Sakis went to a metal show and joined the mosh pit as a part of the audience, not as a performer. Oh, all the time. He said. I go everywhere, a different show each week. Unfortunately, I’m away on weekends so I miss out on a lot of gigs but when I’m here I always go to the shows. I was going through your old interviews and I stumbled upon a statement that I really liked: Metal is the only and main cultural export of Greece. Would you like to elaborate on that? Yes! As much as we want to think that we still export culture, we don’t anymore. I’m not claiming that metal is everyone’s cup of tea, but the Greek metal scene is very active and powerful. 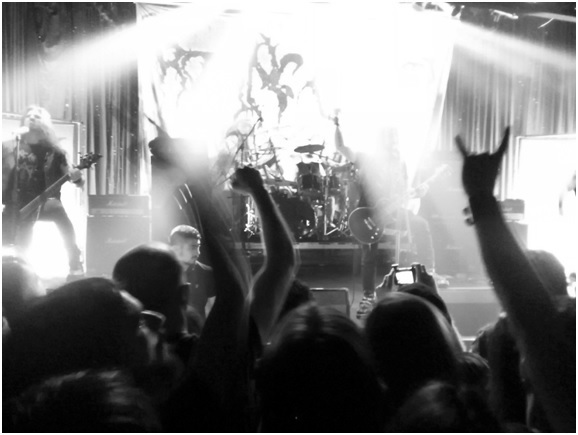 How many Greek metal bands are on tour as we speak? Can we say that about any other music genre? So, that’s our main export. Maybe it’s not the kind of culture that most people would want but we are independent and that brought us here today. We don’t expect sponsorships. If you think about it it’s a revolution. We are trying to enter a global scene that’s based elsewhere. That requires double the effort but it’s our honor. Let’s talk about rituals. Real life daily rituals. When you are not on tour, what does a typical day in your life looks like? I’ve always been a deeply concerned individual. A thinker. I tend to ponder. But I’m also kind of stereotypically average. You’ll find me on a train, at the IRS office. We all have needs and I tend to mine. Do you wake up early? Do you cook? Yes! I do now absolutely. That’s the only thing I do differently now, I wake up early in the morning. I found that it’s the only way to get things done. I used to wake up very late, I wasn’t always that organized, but it’s the only way to get a head start and get things going. Saki, do you write music when you‘re not happy? Yes! I don’t really compose when I’m happy. I’m getting wasted. But when I’m sad, I start thinking. And creating music is my only way out. Mixed feelings here Sakis. We obviously want you to be happy but we need your music as well, I said laughing. We don’t always need to be happy he said. Life has ups and downs. We can’t always be happy. It’s the yin and yang, the black and white. It’s all about finding balance. What bores you to death? To the point that you don’t get to it at all? I hate bureaucracy. Worst feeling in the world. I just can’t. Nietzsche is not a nihilistic influence! On the contrary! I have been influenced especially on the latest album by heretics. People who have been blamed as heretics for going against the system. We are a part of the scene as well even though we don’t prefer to rebel for no reason. I go against the system when I see that there’s no proper justice. When something feels wrong. Now, who’s to judge what’s right or wrong? I’m only speaking for myself. That’s the reason behind those influences. That’s why I wrote the Heretics. Now, if that’s nihilistic like our friend said, I don’t know. What makes a great first impression? Being humble and honest. I really do appreciate that. 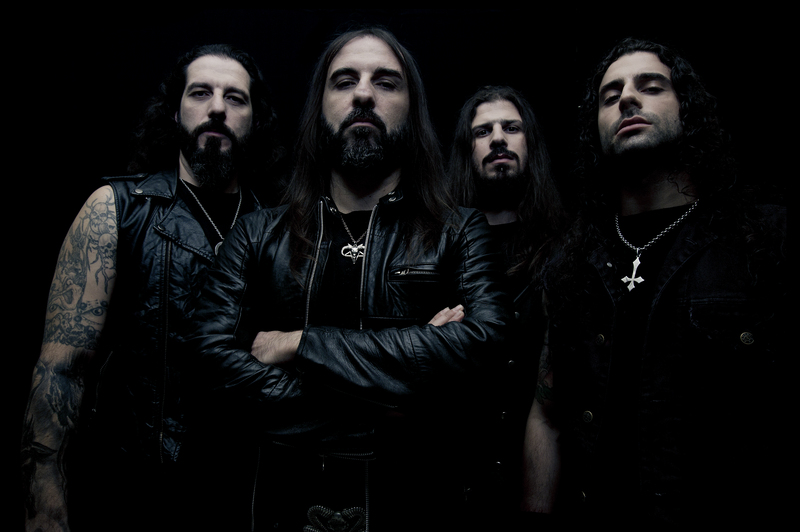 Rotting Christ was recently forced to cancel a show. They were not allowed to play for mainly religious and/or political reasons. They have already given plenty of interviews at the time, so I wasn’t actually planning on taking to Sakis about that. But at the very last moment, I thought that maybe I should at least mention it, just in case he felt the need to touch on that, since our platform, MHF, could be used and utilized to voice such issues. It’s just sad he said. It goes against all human rights. It makes me sad, witnessing things like that taking place in the very same country that created the concept of democracy. You may not agree with certain people or certain concepts but that doesn’t give you the right to take away their free speech. Especially when we are talking about art. Art is supposed to be a sanctuary for all of us. For the heretics. What are we left with if they take art away from us? The reason why we fight as a band is this: Freedom to speak our minds. Yes. But such events bring us all together, right? I think you once said ‘Metal Should Unite People” and in a way through that unfortunate event, it did. Yes! Yes! That really makes me happy! It did bring us all together in an unexpected way. I realized that there are so many of us! I see a spark in the new generation’s eyes! Let’s finish up strong Sakis! What makes you laugh, what cheers you up at the end of a long day? Watching videos at the end of the day. Like Youtube videos, cheap funny videos to release the stress of a long day. It might not be substantial but it makes me feel good and I’m certainly not an elitist, just like anyone else I will watch and laugh at the most ridiculous things! I thought it was time to let him go back to his funny videos, after all, it was very late and we all had such a long day. 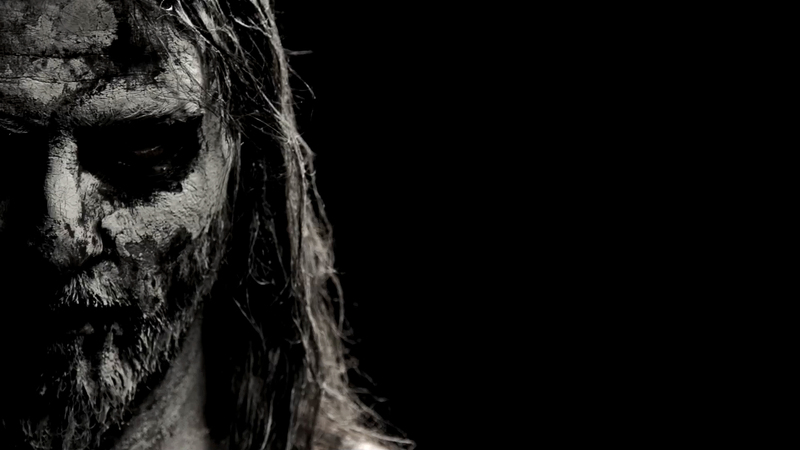 My day ended with an amazing chat with Rotting Christ so no complaints here. Except for the broken tooth, that is.